The Western Wall (the Kotel in Hebrew) is impressive, but its greatness is truly discovered when you descend underground to the Western Wall Tunnels. The tunnels run along approximately 488 meters of the Western Wall, giving visitors a taste for the challenge that stood before Herod the Great during this biggest of all his immense building projects—the expansion of the Temple Mount. One such example is the famous western stone which is 14 meters long and weighs almost 570 tons. These complex underground tunnels create a direct link between the history of the Hasmonean period and modern times. The tunnels are supported by many arches and contain stairways that connected the ancient city with the Temple Mount, over the Tyropoeon Valley that ran along the western side of the Temple Mount, separating the two. Today these passageways support streets and homes in the Muslim Quarter. The tunnels were first discovered during digs done by British archaeologists in the 19th century, but the real digging was done after the Six Day War, after 1967, by the Israeli Ministry of Religions. One of the most special places to visit inside the tunnels is the part of the Western Wall traditionally considered closest to where the Holy of Holies used to be on the Temple Mount. The Holy of Holies, where the Foundation Stone and the Dome of the Rock are located, is the holiest place for Jews. In this location in the tunnels, there is a small synagogue where Jews come to pray. The entrance into the tunnels is on the northern side of the Western Wall plaza, a few meters away from the Western Wall. Upon entering, visitors walk through a series of rooms moving eastward until they hit the Western Wall. From that point on the tunnels continue straight northward directly along the Western Wall until the west-northern most point. 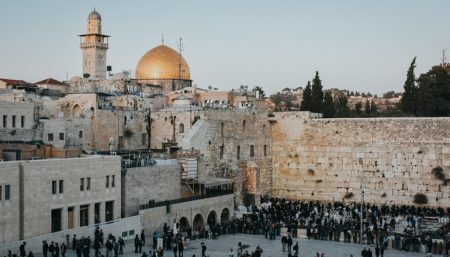 During their walk in the tunnels, visitors will pass by Second Temple era homes, ancient cisterns, constructions from the Muslim period, an aqueduct from the Hasmonean period and more. In order to visit the Western Wall Tunnels you must join a guided tour which needs to be ordered in advance. These guided tours into the depths of the earth tell the fascinating story of ancient Jerusalem and how it continues to be meticulously discovered underground, dug out slowly and carefully. See discoveries which until recently were hidden from residents and visitors of today’s Old City. The tour lasts around 75 minutes. Click on the “BOOK NOW” button at the top of the page to order your tickets today. This attraction is accessible to people with disabilities. Speak to them before coming to organize your trip. The huge stones! The history! The significance of the temple and proximity to the Holy Place. And the beauty of the new synagogue within the old place. This is just amazing! We traveled with a tour company and I was so pleased that we went into these tunnels that I did not know we were going to do this previously. It was very interesting and unexpected. Really enjoyed all that we saw. The best part for me was the opportunity to have a second chance at something special. If you happened to have read my review of the Western Wall, I wrote about that experience saying how I missed the sharing of it with my husband, because the men and women are separated. Well, during this tour, we were able to share that moment together on the other side of the wall. I also found out that when he was on the Men's side out there, he had not made his way up to the wall because of the extremely crowded conditions. So this was a double joy for me. I hope you will enjoy both the Western Wall and the tunnels as much as we did. I try to do as much research beforehand as for me traveling that has made alot of difference. Hence why I read alot of trip advisor reviews. It helps if people are specific ... 2nd time in Jerusalem 1st time doing the tunnel tour. I love the history behind the Western Wall, the 2nd temple discussion and where it has led to this time in history. 1st off, I of course has a reservation but... you have to actually get the tickets in the tunnel/western wall security check point inside the Old City to the left of the staging point. Also, from years of doing this things change so can't say where it may be in the future. Don't remember the womans name as our tour guide but I thought she did a great job. smaller group which helps. This is a great tour to get a handle on how this city has evolved and why some things are the way they are. There were a few close quarters but it is nothing like the City of David tour so don't let that stop you. this is so worth doing.